During the seven-day holiday period, cruise tourism in Sanya has attracted a large number of tourists. From February 9 to 12, the number of cruises calling at Sanya Phoenix Island International Cruise Terminal reached 8, transporting a total of 5,700 passengers, and the number of the inbound and outbound cruises is expected to reach 30 on February 24, the Chinese Lantern Festival. Sanya Phoenix Island International Cruise Terminal has received 572 inbound and outbound cruises and over 550,000 passengers since its official opening in November 2007. The world’s top three cruise liners operators also have opened cruise routes in Sanya. In 2008, Sanya port ranked number one in China in terms of the passenger volume it received, a figure more than the total number of other cruise ports combined. 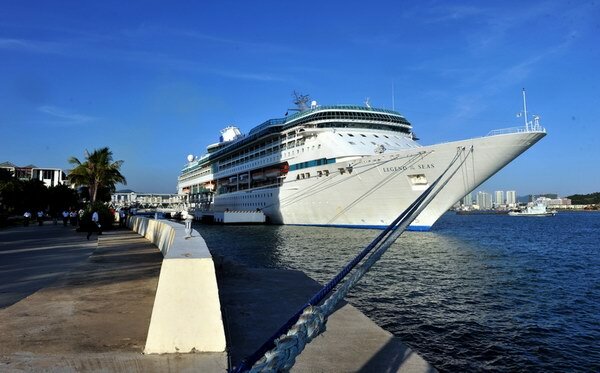 In 2012, a total of 172 cruises called at Sanya port with revenues generated reaching nearly 1 billion yuan. To date, Sanya port has seen 262 inbound and outbound cruises.